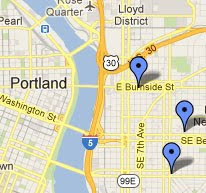 No city in America is more associated with food carts than Portland, Oregon. Czech, Mexican, Japanese, Thai, Korean, Chinese, Greek, Indian, Polish, Turkish, Venezuelan, Southern, Barbecue...you name it, Portland's probably got it in a convenient on-the-go form. Neapolitan-style pizza, though...now there's a rare commodity in the food cart scene. Until today, I was aware of only one food cart serving this kind of pizza in the city, and that was Wy'east over on SE 50th. There, proprietor "Squish" cooks his Naples-and-New York-inspired pies one at a time in a tiny gas-fired oven, and does a very fine job with it. 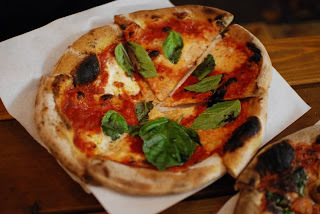 But then a friend of mine alerted me to another food cart in Portland over in SE 12th and Hawthorne's "Cartopia," one that was serving Neapolitan/NY-style pizza from a wood-burning oven. A wood-burning oven. In a cart. My mind was effectively blown. How could that work? A wood-burning oven in one of those diminutive shacks-on-wheels certainly seems like an accident waiting to happen, at worst a death wish for some suicidal pizzaiolo wishing to submit his body to the conflagration with which his product so desperately communes. Gathering my neighbors from across the street (who with their far superior camera graciously provided some of the photos for this piece), I set out tonight to see just what sort of madness was at play here on this cold autumn's eve. 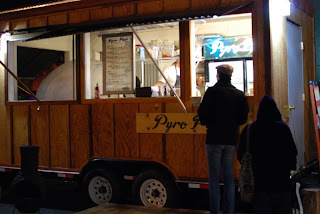 Pyro Pizza is a more intimidating cart than most of the others clustered in "Cartopia." It sits higher than the others, requiring the use of a deck to reach the service window, through which owner John Eads's surprisingly large domed oven can be viewed plainly. As we approached the cart, Eads was gathering what looked like alder wood for the oven. He brought the wood to the side of the cart, where a chopping block and maul lay waiting. Yes folks, he proceeded to chop the wood then and there, splitting it to a size better suited to the oven. I can think of no better way of measuring Eads's pride in his work, that his love of pizza would permit the necessity of the most primeval means of manual labor: splitting firewood. Not for a brick-and-mortar pizzeria, may I remind you, but for a pizza cart. That's dedication, my friends. Filled with an immense sense of respect for the man, my friends and I ordered two pizzas off the menu: the traditional Margherita (with mozzarella di bufala! 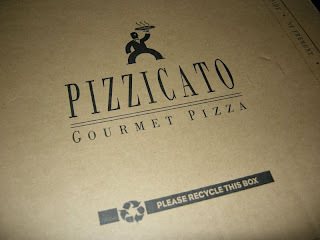 ), and the daily special, which was the roasted garlic, plum tomato, spinach, and gorgonzola pizza. Both were ready in five minutes, twelve-inch wonders served simply on wax paper in reusable baskets. I sampled the Traditional Margherita ($8) first. Eads spreads his dough very, very thin, and this makes for a marvelously crisp crust with light-to-moderate charring on the underside. The cornicione is large, puffy, and chewy, with a nice hole structure. I should note that Eads makes his dough fresh every day with Bob's Red Mill whole wheat flour, but for whatever reason, it doesn't smack of whole wheat like the many other versions I've tried over the years. Eads's crust has the flavor of good bread, and thankfully is neither fibrous of texture nor "healthy" in taste. You know what I mean. I think the crust is pretty great, and with the heavenly black blisters making periodic appearances, worthy of being eaten in its entirety. I'm curious to know where Eads gets his buffalo mozzarella, because while it tasted fine on the Margherita, its time spent in the oven disintegrated every ounce of it into ricotta. It's tough to tell by looking at the pictures, but trust me, it was evident on the first bite. Very peculiar. 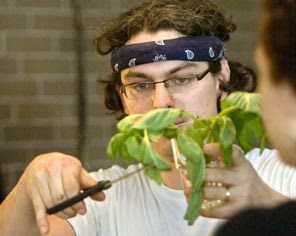 I'm also curious to know where he gets his gargantuan basil. I mean, just look at the basil in that first shot of the Margherita. It's huge. Took up the whole slice! It tasted great, too. Fresh, vibrant, and full of flavor. Speaking of the basil, I washed down my pizza with Eads's homemade Basil Lime Soda ($1.50). This was an initially strange yet oddly satisfying soda in which you could very much taste the basil of its namesake. I don't know how Eads makes it, whether he uses fresh basil and extracts its essence or achieves it by some other means, but this is a winner. The second pie, the Daily Special ($8), was much heavier on the toppings, and as such the crust wasn't quite able to support them (though a quick fold remedied that). There are a lot of strong flavors working together here: the gorgonzola is aggressive with a very pleasant bite, the bits of plum tomatoes provide wonderfully sweet explosions of juice, and the huge chunks of roasted garlic ooze their fragrant oils over the entire pie. I couldn't quite taste the spinach, but given those first three ingredients, it's easy to understand why. I liked the special with its complex, robust flavor set, but it was hard to eat more than a slice of it. It may be too rich for my palate, but others bored of the more basic pies may find just what they're looking for here. It's a great pizza for sharing. Before we left, I managed to speak to Eads briefly about Pyro Pizza and the fact that it has been open for only two weeks now. We also chatted about his oven, which is comprised of a brick floor and a refractory dome. Eads says he built the oven first on the four-wheel flatbed, then built the trailer around the oven. It's now crammed full with a work counter, coolers in the back to store the various ingredients and sodas, a fully functional sink, shelves, and even a rack of fancy lights (which you can kind of see in the photo above). This was clearly a planned operation, and if it wasn't, then I'm even more amazed. Eads already owns another pizza cart in downtown Portland called Give Pizza a Chance, an establishment I have not yet frequented but certainly will after my experience here. It's still early in the life of Pyro Pizza. There are some kinks to work out, but so far the pies coming out of John Eads's oven are surprisingly good for pizza from a cart of all places. Next time (and there will definitely be a next time) I'm going to try some of the other items on his menu, including the pepperoni and the Cuattro Formaggi. I've also heard that Eads on occasion makes a bacon-and-egg pizza, which I'd love to sample. For the prices Eads is selling these pies, you're getting a heck of a deal. If you're not in the mood to wait in line at one of Portland's more popular pizzerias, I highly encourage you to swing by Pyro and get your fix. It's quick, it's good, and Eads's love of pizza comes through in every bite. Pizza blogs are a dime a dozen, but one blog stands head and shoulders above the rest (including this one). Do I even need to tell you? Adam Kuban, a former Portlander, moved to New York City around the turn of the century and founded Slice as an ode to his one true love: pizza. Okay, maybe he has a different true love, but I don't know him that well, so let's just assume it's pizza. Anyway. Slice. It is the pizza blog to read on the internets. Slice got picked up by Ed Levine's Serious Eats, which just happens to be the food blog to read on the...yeah, you get it. Both sites have benefited from the association with the other, and both are mega-popular among the foodies. 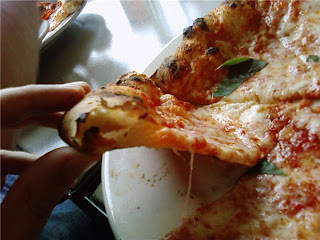 If you want to know about pizza--not just in NY, but across the world--you read Slice. So imagine my excitement when I learned that Adam Kuban was about to embark on a serious pizza research expedition of the West Coast, and that his first stop would be Portland, Oregon (you know, where I live), and that he wanted me to join him on his two-day Portland pizza crawl. As the writer of a pizza blog, I am shamefully indifferent to the idea that a site like mine (well, mine specifically) should offer its readership such amenities as, oh, daily updates, or comprehensive pizza coverage. I'm just too slow and lazy to be on top of things like that. In Portland, this tiny speck of a metropolis, you can count the notable pizzerias on one hand (plus one or two extra fingers if you're feeling generous). Of these six or seven pizzerias, I had visited a grand total of three. Just disgraceful, yeah? That was all going to change now with Adam Kuban's arrival. Since he wanted to hit as many of Portland's best pizza joints during his brief stay in town, and since I was going to pal around with him the whole time, I was going to get to try two new places I hadn't hit yet and probably wouldn't for another few months of procrastination. It was perfect: work and play, living together in joyous harmony like the slogan on some peacenik bumper sticker on the back of a brown 1987 station wagon. We hit Ken's Artisan Pizza first. 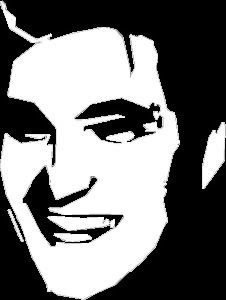 You all know how I feel about Ken's (and if you don't, just read about it here). I wanted so desperately to have that high opinion validated by hearing Adam say he loved it too. I knew my plan couldn't fail. You see, I had a secret weapon: it's called the Soppressata Basil pie, and Ken's makes a masterful version of it. I knew that if Adam tried this pizza, he'd become a believer. Then God in His infinite jest proved once again how little control we have over this world of ours and halted the production of the soppressata Ken's uses for one week. The one week Adam Kuban of Slice was in town, he would not be able to eat my absolute favorite meal in Portland. This is the definition of suffering. We still had a great meal at Ken's. The hit of the evening was the fennel sausage & onion pie, to which we added hot Calabrian chilies, and Adam loved it (or at least he said as much to placate me). You can read his thoughts on the experience here. From Ken's we went directly to Wy'east Pizza, the cart two blocks north of Powell on 50th (you can read my impressions here and Adam's here). We ended up getting the last ball of dough for the evening, but had to wait about two hours for the finished pizza (Wy'east cooks only one pie at a time, you see, so the queue fills up rather quickly). It tasted the same as it did the first time I was there, which is to say that it's a decent pie (made even more so by the fact that it's from a cart, though that crust was still lacking in flavor. On Day 2, the schedule was tight: Apizza Scholls, followed by Nostrana, then concluding with Al Forno Ferruzza. Had I any foresight whatsoever, I would not have gorged myself at Apizza Scholls. I am in love with Brian Spangler's sausage pie, and tonight's was no exception. Just the best sausage pizza in the world. We also tried the 'Margo'rita, the Apizza Amore (a 'Margo'rita with hot capicola), and the house special, which had some kind of pork, onions, and Italian spices sprinkled on top. All were magnificent, and Spangler was a gracious host. He even handed out free T-shirts. Cool! You can read Adam's opinion here. There was no delay between Scholls and our next destination, Nostrana. Nostrana is a full Italian restaurant, offering many great entrees on its menu, but we were only there for the pizza. Nostrana has the distinction of being the only pizzeria in Portland with VPN certification (CORRECTION: Nostrana is not VPN-certified. They have a Vera Pizza Napoletana sign up for "decoration" inside the restaurant, but no actual certification). This can mean anything, really, as it's no true indication of the quality of the pizza, only that it has been made to the precise specifications of the Verace Pizza Napoletana organization in Naples, Italy. So it was with high hopes (and a full stomach) that we sat down and ordered a single Margherita. The pie was out of Nostrana's wood-burning oven lickity-split and placed before us piping hot. Nostrana, in the true Neapolitan tradition, does not cut its pies, instead opting to present its pizzas to the customer as whole discs. They do, however, provide some durable kitchen shears that do the job nicely. There's some kind of joyous youthful nostalgia that comes with picking up those scissors and cutting into your pizza as if it were construction paper, and Adam and I actually did a pretty good job of dividing the pie into six equal slices with them. As for the pizza itself, it didn't rock my world. It's far from the best Neapolitan-style pizza I've had in the United States, and not even close to the top of the list for even the Pacific Northwest. The best thing about it is the sauce, as it's a pretty standard San Marzano blend. The rest of the pie seems a step down in quality from other VPN-certified pizzerias I've visited, such as Tutta Bella and Ristorante Picolinos in Seattle. 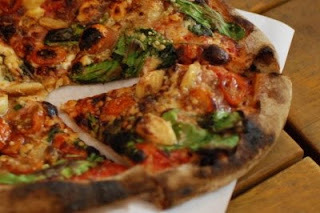 The crust that night--crisper than most Neapolitan pies--was a little bland, and the mozzarella was on the thick side. It's not a bad pie by any means, just not an outstanding one. And next-day reheating is out of the question: I tried it, and it was a disaster, turning the crust to rubber and the collective flavors to something very unappealing. I still recommend you get a pizza when you come here, but get one with more toppings on it, and finish it there. Last stop of the crawl: Al Forno Ferruzza, the former PSU-adjacent cart-turned-brick-and-mortar pizzeria. 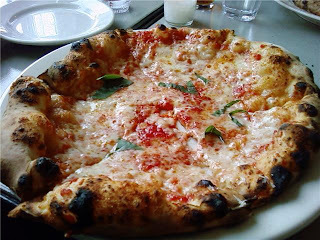 Adam and I were joined by one of his old Portland pals, and the three of us dug into the house Margherita. I think Adam said it best: "It smells and tastes like the pizza I make at home." This is actually a dead-on assessment of the pizza at Al Forno Ferruzza. The crust is salty and chewy, not astoundingly airy but not overly dense either. The sauce is alternately smooth and chunky (I got an enormous cube of tomato on my slice) and just a little too salty, often pushed aside by the mounds of too-thick cheese that hasn't been in the oven long enough to melt fully. Rounding out the toppings is a nice grated Argentine parmesan that helped give the pie a little more character, which up to this point had been lacking. Like Nostrana, this isn't bad pizza. Far from it, actually. It's just not blow-your-mind pizza like Ken's Artisan or Apizza Scholls. If you're hungry for pizza and you're in the neighborhood, and don't feel like driving/waiting in line at either of the two Big Ones, you could do worse than Al Forno Ferruzza. I've heard the calzones are killer, too; next time I'll try one. So that was the two-day pizza bonanza with Adam Kuban. I had a blast, and I hope Adam did, too. He flew off the next day to hit a few places in Seattle (among them Serious Pie, which I'll be writing up next), followed by San Francisco, L.A., and Phoenix, so his pizza binge was just getting started. Me, I had enough leftovers in the fridge from these shenanigans to cover lunch for a week, but somehow I couldn't bear to look at another slice for...well, at least a day. Hey, there are starving kids in Africa. Can't let this perfectly good pizza go to waste. I can't think of a single pizzeria in recent memory that's opened with more buzz than Delancey in the Ballard neighborhood of Seattle. 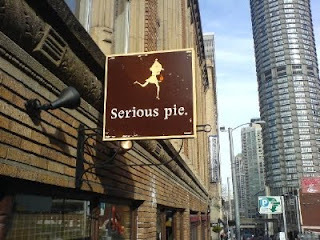 Mega-popular food blogger Molly Wizenberg of Orangette used her not-inconsiderable charm on her flock to champion her husband Brandon Pettit's vision for sublime Neapolitan and New York-inspired pies long before anyone had tasted a bite, but the hype didn't stop there. Pettit managed to build up an impressive following on Twitter (at last count, nearly 2,500 followers) as he detailed the day-to-day minutiae of putting together an artisan pizzeria in a space that needed substantial renovations. News that he had fine-tuned his recipe after visiting such pizza goliaths as Di Fara in Brooklyn, Pizzeria Bianco in Phoenix, Ken's Artisan Pizza in Portland, and Mozza in Los Angeles had the foodies foaming at the mouth. Even New Yorkers heard the whistle of the rumor train barreling down the tracks toward them, demanding their attention: a serious addition to American pizza would soon be birthed, not in Manhattan or Brooklyn, but in the country's grey-swathed shoulder. No, not Maine, the other shoulder. Naturally, such fervent expectations are eventually met with the inevitable smack of reality, and oftentimes it can be sobering just how spectacularly those assumptions of greatness have misfired. Praise the pizza gods then that this was not the case with Delancey. I first visited Delancey a few weeks after it had opened with my siblings and a friend, arriving at the restaurant fifteen minutes before it opened. A line had already started to form at the door, so we took our places dutifully and watched as the tail behind us lengthened with each passing minute. Soon enough, though, the doors open, the smell of baking cookies drifted out, and we were ushered inside to a four-top possessing the distinct advantage of being located next to the restaurant's large street-facing windows, allowing much natural light to fall beautifully on our food. We began with a salad of sweet corn, basil, and cherry tomatoes tossed in a shallot vinaigrette, which was clean and crisp and very fresh. Delancey offers a nice selection of beers on tap, though one we had wanted to try, the Chucanut Helles, had been tapped out the night before, and they had not yet procured a replacement. We chalked it up to First Month Syndrome and went with the tasty Hales Red Menace instead. It wasn't long after we placed our order that our pizzas arrived (oh how I love the abbreviated cooking times in a blazing hot wood-fired oven! ), steaming and giving off the irresistible scent of freshly baked bread. The sauce looked bright, the cheese gooey and inviting. We quickly tore into our fare and were not disappointed. We split two pizzas that visit. The first was the Brooklyn ($12), a cheese-lover's go-to pie with the house tomato sauce topped with both fresh and aged mozzarella (a combo I always find impeccable for pizza), along with basil and grated Grana, a hard cheese from Italy that's very close to Parmigiano-Reggiano, salty and sharp (essential qualities in a cheese, I say). This really was a great pie. Brandon's sauce has superb tomato flavor, with tones of garlic playing in the background. His crust bears the appearance of a more artisanal pie, with plenty of blackened bubbles and blisters, but is as soft as any Neapolitan pie I've eaten. The hole structure is airy and light, with a wonderful chewiness to it. This crust tastes of sourdough and the terrific smokiness of burning wood, and to leave the cornicione uneaten is unthinkable. It's too good to leave behind on your plate, and I doubt very much you'll have any other notion than to finish each slice in its entirety. Our second pie was the Pepperoni ($13.50), which is the Brooklyn with the addition of gourmet pork shoulder pepperoni from Seattle-based Zoe's Meats. This pepperoni is leaner than most pepperoni you'll find, and as such is a little less greasy than most. It tastes great, though I wish it were cut just a little thinner so it would crisp more in the oven. This is just a matter of personal preference, though; there's absolutely nothing wrong with this pie, and the addition of this fine meat to the Brooklyn took it to a level I for one found very satisfying. Rounding out our first trip to Delancey was the Bittersweet Chocolate Chip Cookie with Grey Salt ($3.50). At first glance this dessert appears to be just your ordinary average chocolate chip cookie that someone had spilled large-grained salt on, a prospect some might find confusing in theory. However, having sampled the unparalleled sea salt-enhanced butterscotch budino at Mozza in LA, I knew just how powerfully the addition of good salt can transform a dessert from the decent to the decadent. So I dove right in. The cookie, still warm, is soft, chewy, and thick, the bittersweet chocolate chips melting on your fingertips. On its own, it's a fine version of a standard chocolate chip cookie, but that sea salt...too good. About a month or so later I hit Delancey again with nearly the same crew as before. Brandon had worked out some of the kinks in his new venture (though somehow that Chuckanut Helles was still tapped out! ), and I'd heard the pies coming out of the oven were better than ever. He also offered a wider variety of pizzas on the menu, and I was very eager to sample his take on the sausage pie. Of course I ordered it straight away. 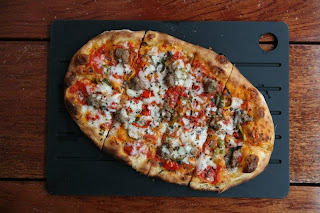 The Sausage Pie ($15) begins with the base of the Brooklyn and includes pork fennel sausage, which is made in-house. This excellent sausage is crumbled over the whole of the pizza, assuring that every slice will pack that sweet, meaty goodness you're expecting. So far, this is my favorite pizza at Delancey, and the one I will recommend to fellow pizza enthusiasts, though next time I'll see about tossing some peppers or chilies into the mix. Having inexplicably skipped it during my first visit, I also ordered the house Margherita ($12). It's a first-class Margherita, on par with the best I've eaten in Seattle. That great tomato sauce, creamy fresh mozz, potent basil (cooked on the pie), and swirl of olive oil works so well, it's hard to imagine improving on it. If this is your first trip to Delancey, order it. We also tried the Zoe's Coppa this trip, a sort of antipasti plate with deliciously salty capicola sliced so thin you could read through it and house-made pickled peppers that were alternately spicy and sour, sweet and potent. This dish lasted about ten seconds before our party removed every trace of its existence from this world. It's a great little dish, but at $8 a tad on the pricy side. Mitigate the cost, as we did, by splitting it among several diners (and fight dearly for those pickled peppers). In just a few short months Delancey has raised the bar for pizza in Seattle and established itself as the primary destination for the city's lovers of the pie. Wait times can be brutal, so I recommend getting there within 10 minutes of opening time, or after 8 p.m. But no matter how long you end up having to stare at the seated diners and curse their existence for taking up precious table space, I can promise you this: your meal will be well worth it. The final leg of my New York immersion had me hitting two of the more recent pizzeria success stories: Keste and Artichoke Basille's. Keste prides itself on its Neapolitan pizza, but it doesn't strictly adhere to the VPN's stringent rules, and it's all the better for it. I only had the Margherita there, but it ended up being one of the best Margheritas--and certainly the best Neapolitan-style Margherita--I've ever had. Though the crust was fantastic, I think it really came down to the cheese and sauce with this pie. The sauce didn't hit me with the burst of TOMATO like it does on just about every other Neapolitan pizza I've eaten. It felt closer in nature to Chris Bianco's sauce, though still distinct enough to set itself apart. Simple and elegant. I thought it was amazing, and along with Keste's exceptional house-made fior-di-latte--which unlike most fresh cow's milk mozzarella was extremely flavorful--made every bite better than the last. Yes, all the usual components of pizza greatness were present, the perfect char and airy hole structure of the soft and pliant crust, the smoky flavor of the wood-fired oven coming through loud and clear. If you're in town, I highly recommend it, and I eagerly await my next visit. The final stop on this mini pizza tour was the much-hyped Artichoke Basille's in the East Village. Many New York food critics seem to love this place, and because it was so close to my hotel, I knew I had to see what all the fuss was about. Artichoke Basille's claim to fame is its "artichoke slice," which is essentially a plain slice of NY-style pizza covered with a thick layer of artichoke dip. I am not kidding you. I'm not a big fan of artichoke dip at all, but I knew I had to try it. So I ordered a slice of that, a Margherita slice, and one of their Sicilian slices. Let's just get this out of the way: that artichoke slice is an abomination. It isn't the flavor, because I actually thought the "dip" that comprised 60% of the slice was mildly tasty. No, I think it's the quantity of the dip that got to me. There's just too damn much of it, and I cannot imagine eating an entire slice of that stuff. I had only about a third of it and my stomach tilted rapidly toward the queasy side. I knew I couldn't get another bite down. The third slice I ordered blew the other two out of the water. Artichoke Basille's Sicilian slice is superb and without question the best thing on their menu. The crust is very crispy, crunchy, and unlike the NY-style slices here, has a lot of flavor (though, as you can see in the pic, mine was just a tad too blackened -- and before you ask, no, those aren't my dainty black-nail-polish fingertips holding up the slices). Even better is the copious amount of the house tomato sauce on this slice. This sauce tastes exactly like the freshest, ripest tomato on the vine, and I couldn't get enough of it. The same boring mozz and parm floated atop the red sea of goodness, but I just ignored the cheese altogether and savored every bite of that tomato sauce. They ought to think about ditching the round pies and selling this sauce in jars instead. I'd buy it. Two of the three food critics of New York Magazine cited Artichoke Basille's Sicilian slice as their favorite pizza in NY. It's quite good, but I cannot agree with them. Instead, I must side with NYM's third critic, Adam Platt, who declared Di Fara his pizza of choice. Di Fara definitely had the best pizza I ate in New York, and absolutely worth the trek to Midwood. If I had to rank every pizzeria I visited (because I know how much everyone loves a damn list), I'd put Di Fara at the top, followed by Keste, then Motorino, with Artichoke Basille's at the bottom, and if I knew someone was visiting the city, that's the order I'd recommend to them. You'll find something worth your while at every one of those places, which is pretty exciting, if it's any indication of the quality of the rest of New York's premier pizzerias. I can't wait to go back and try another batch. Anyone feeling generous enough to front a plane ticket?